WATERWAYS / SONS OF ALPHA CENTAURI / HOTEL WRECKING CITY TRADERS (s/t) Split 12"
This colourful platter has been released by the Australian label Bro Fidelity Records and it features three bands from three continents. I think this sounds pretty good, because it will offer the interested listener a good possibility to explore unknown acts a little more closely. Side A kicks off with Southern California's WATERWAYS, featuring Gary Arce (Yawning Man, Sort Of Quartet, Ten East, Dark Tooth Encounter) as well as Mario Lalli (Yawning Man, Fatso Jetson). I was introduced to WATERWAYS when I wrote a review about their split 7" with Yawning Sons back in 2011. The four included songs on this record remind me that I should listen more often to abovementioned 7", because once again WATERWAYS manage to attract my attention with the greatest of ease. This is due in large part to the beautiful lightness and intense coolness of their music. All of this is enhanced by the gorgeous vocals of Abby Travis. She gives the music an ethereal vibe and additional depth, ensuring even more atmosphere. The music is still hard to pigeonhole. There's a bit of 1960s surf music, combined with country and psychedelic pop. In between there's Mario Lalli's signature guitar work that characterises their music. I like 'The Blacksmith', because it sounds as if it's loosely based on 'Ghost Riders in the Sky', but 'Queen (Of The Passout Riders)' is definitely my fave of all four songs. Somehow, this song reminds me to The Walkabouts during their best period. 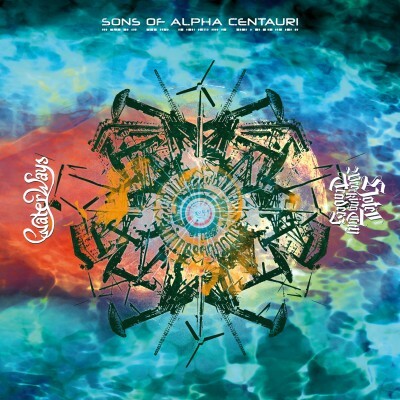 It continues on Side B with UK's SONS OF ALPHA CENTAURI which are completely unknown to me. '27' is the name of their previously unreleased song, which dates back from the recording sessions for their debut album released in 2007. In contrast to WATERWAYS, SONS OF ALPHA CENTAURI have a stronger penchant for heavy riffs, which are punctuated by tranquil passages. They offer a song structure with slightly progressive undertones, where the lack of vocals is no drawback, but rather the contrary. It's a very solid tune that makes me longing for more. Australia's HOTEL WRECKING CITY TRADERS complete the 12" with another instrumental song named 'Pulmo Victus'. This duo loves to explore cosmic territories. 'Pulmo Victus' is centered around a single tracked guitar loop, whose hypnotic effect you can hardly ingnore. This is reinforced by an almost steady beat, played by loud drums. There's also a pleasantly mellow-sounding natural guitar that forms a nice contrast to the heavy buzzing and drumming. All that comes together in a wonderful sonic psychedelic trip that is rich in emotion as well as in sublime melodies. Overall, Bro Fidelity Records succeeded in compiling a Split 12" which is bracing and refreshing to the ear.